After the excesses of the festive season, lots of people choose to go vegan in the month of January and extend it further than what they eat, to the products they use. I must admit that I haven't participated on the food front but I have increased my meat-free days this month, which is something I will continue to do. Thankfully, choosing products to use is an easy way to begin a vegan lifestyle and there are so many brands striving to be vegan these days that it is no longer restrictive. One such brand is Antipodes (18 products within the brand are vegan) and I want to share my thoughts on some products with you today. 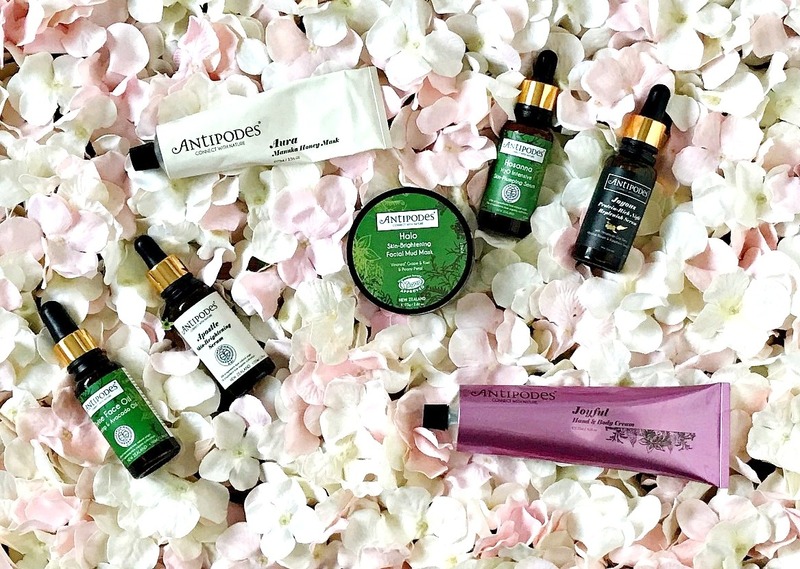 You will have seen this organic brand on my blog numerous times previously but if you aren't familiar with it, Antipodes hails from New Zealand and the founder has a scientific background, which she combines with her love of high quality natural ingredients to create effective, organic products. Halo Skin Brightening Facial Mud Mask: This mask forms part of the vegan line and I think it would be suitable for all skin types. It contains Volcanic Mud, which deeply cleanses and decongests the skin, Peony, which brightens the skin and Vinanza Grape and Kiwi, which target melanin production. As with most mud masks, this feels tight on the skin as it dries but if you don't like that feeling, you can use a facial mist to prevent it from drying out completely. I apply a thick layer on clean, dry skin and leave for around 15 minutes. Warm water and a flannel are needed to remove every trace of this mask and skin is left feeling soft and smooth and looking clear, bright and radiant. £26.99. Aura Manuka Honey Mask: I've mentioned this mask several times on the blog and with good reason! It hydrates, soothes and heals the skin. Suitable for all skin types, this mask is ideal to use if your skin is suffering the effects of too many acids/peels or to combat the effect of harsh weather. Manuka Honey has many benefits for the skin in terms of healing, calming, reducing inflammation and decongesting - it's a wonder ingredient, which makes this mask perfect for a weekly treat. £24.99. Hosanna H2O Intensive Skin Plumping Serum: This forms part of the vegan line. This lightweight oil-free serum is perfect for dry and dehydrated skin. It instantly quenches my skin's thirst leaving my skin looking plump and feeling hydrated. It is scientifically proven to increase synthesis of collagen production by up to 72% which in turn encourages cell renewal to reveal bright, hydrated skin. I like to use this as part of my morning routine. £29.99. Apostle Skin-Brightening Serum: This forms part of the vegan line. This is a water based serum that helps to target pigmentation and uneven skin tone, with initial results visible within 5 days. This is relatively new to my routine so I am looking forward to seeing long term results but so far, so good. I don't have any pigmentation issues at the moment (it tends to appear in summer), however, so far I have seen an improvement in the redness in my skin - it looks much more calm and even. It contains Vinanza Performance Plus, which targets melanin production and Vinanza Oxifend, which protects the skin against environmental aggressors and reduces redness in the skin as well as Waiwera Mineral Water to hydrate the skin. Can be used both day and night. £44.99. Joyous Protein-Rich Night Replenish Serum: This forms part of the vegan line. This contains goji berry, red raspberry seed oil, New Zealand blackcurrant, essential fatty acid, vitamins and mineral, all of which combine to increase elasticity, brighten and protect the skin. I apply this at night after cleansing, before moisturising, and find that, with consistent use, my skin is plump and feels more elasticized. The result is youthful looking skin. £39.99. Divine Avocado & Rosehip Face Oil: This forms part of the vegan line. Perfect for parched, dull skin, this oil nourishes while also helps to fade scars and increase elasticity. This combined with Joyous Serum works beautifully to plump, brighten, firm and repair skin, with consistent use. If you are seeing the first signs of ageing creeping in, this oil is for you. £21.99. Joyful Hand & Body Cream: This forms part of the vegan line. This is a recent addition to my collection and I have fallen head over heels for it! It smells absolutely beautiful - summer berries and hibiscus flowers, but it also nourishes the skin really well without being at all greasy. It contains Avocado Oil, Raspberry Seed Oil, Vitamin E, Macadamia Oil and a host of other nourishing ingredients. At the moment I am using it on my hands and elbows but if I could afford to slather myself in it from the neck down, I would! £28.99. Is Antipodes a brand that you have tried or would like to try? I would love to hear! Shop Antipodes on Look Fantastic, Beauty Bay & Feel Unique. All products are bought by me, unless otherwise stated. These products were kindly sent to me but this is not an ad as I was not paid to mention them. Opinion is always my own. Affiliate links may be used.